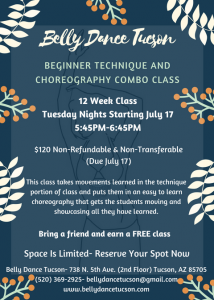 Beginner Choreography & Technique Begins TONIGHT!!! Posted July 17, 2018 by Belly Dance Tucson & filed under Belly Dance Tucson Blog Post, Belly Dance Tucson Events. Belly Dance Tucson Happening TONIGHT!!! 5:45PM-6:45PM- First day of the 12 week choreography and technique series. If you haven’t signed up, it’s ok, there are still spots available- just show up tonight and we will get you all signed up. Beginner friendly! 7:00PM-8:00PM- Beginner Belly Dance- All Levels Welcome- Drop in Friendly- Groupon Friendly for New Students. Like us on Facebook and your first class is FREE! Bring a yoga mat, water, and dress comfortably! Can’t wait to dance with you!